It seems I go through seasons of what I like when it comes to decorating. I’ve gone from not even caring much about decorating my home, to decorating with a traditional feel, to rustic country, and now to a more transitional look (a little mix of traditional and modern). No matter what the decorating style or phase I’m going through, one thing remains the same – I love having God’s word on display in my home. I want visitors, as well as my family, to see God’s word at every turn. One of the things I’ve started incorporating more into the decor of our home is subway art. I love the clean, simple look of it. Some of my favorite ones I’ve purchased over the last year are from DaySpring and Etsy. Since I don’t have a ton of money to just throw into decorating, I try to find ways to decorate for cheap or for free. One of those ways is to make your own decor. I’m not a very crafty person, but I have discovered that it is very easy to make subway art using PicMonkey. 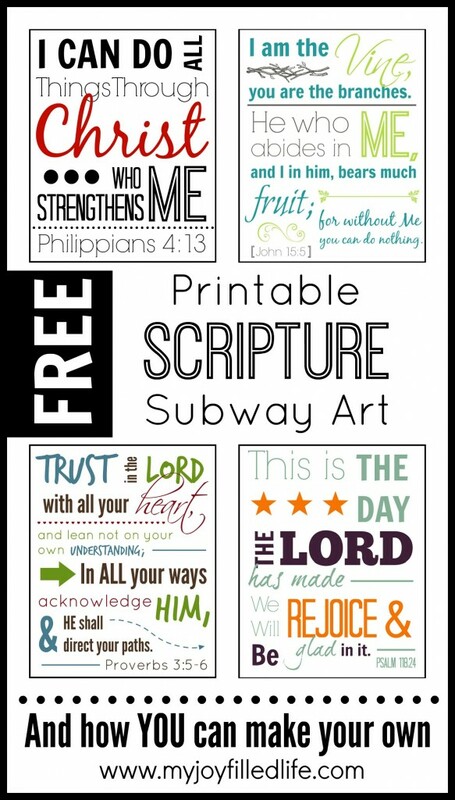 I have made 4 8×10 scripture subway art printables that you can download, print out, and use in your own home. Download the printables/files to your computer and print them for your personal use. Link directly to my blog when telling others about the printable scripture cards. Give proper credit to My Joy-Filled Life when telling others about the printable scripture cards. 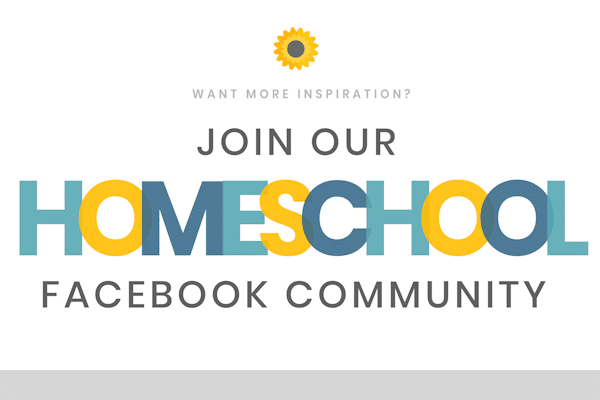 Sell or distribute the printables/files in any way. I’m offering these printables FREE to My Joy-Filled Life subscribers. To get yours, simply subscribe by clicking the download button below and going through the checkout process (don’t worry, it’s FREE). Are you wondering how you can make your own subway art featuring your favorite scriptures (or other sayings)? 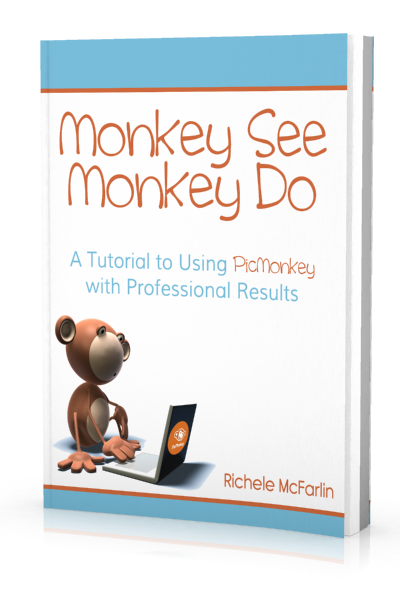 Well here is a great resource that will help you navigate and learn the ins and outs of PicMonkey – Monkey See Monkey Do – A Tutorial to Using PicMonkey with Professional Results by Richele McFarlin. With PicMonkey you can make subway art, scripture cards, invitations, flyers, collages, and edit your favorite photos (or not so favorite photos). Monkey See Monkey Do will teach you editing techniques and tips & tricks with step-by-step tutorials. It looks impressive in the frame! I wish I had a color printer. I might have to see if my husband will print one for me at work. Thanks for sharing! Very, very interesting blog spot. Will look into “monkey see, monkey do”. thank you for the free printable. These are beautiful. Thank you for sharing!! I especially love the “I can do all things through Christ..” Great reminder! Though.. I’m having trouble printing them. When I click on the link it opens the jpeg, but it’s just an image. Not sure how I print it?? I tried opening it in Firefox and Explorer with no luck. Any ideas? The JPEGs are much better quality than a PDF file, so I left them in JPEG format. You should be able to right click on the image and save it. Then open the file and print it out. Thank you so much for these. They are beautiful done. I will be displaying them in my classroom to teach and inspire my fifth graders this year. Much appreciated. I tried to download this… I clicked on the link and it brought up the picture but there was no download icon? Hi Jody – Once you have the picture up just right click on it and save the image to your computer. 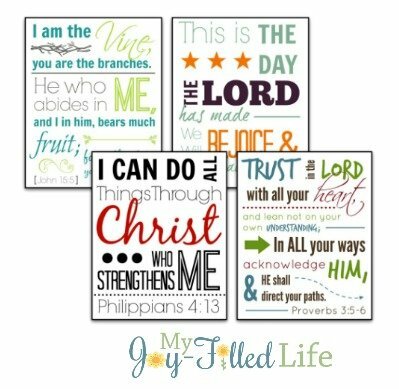 What amazing scripture printables! I would love to download them but haven’t been able to. I am already a subscriber, but when I click on the link it asks me to subscribe again. Would you mind helping me? Thanks so much! Colleen – What links are you clicking on? The ones in the latest newsletter? Do you make printable subway art upon request? I’m looking for the Scripture Romans 4:20-21 NIV. If you can’t maybe you can someone who can. Forever thankful for you and your page. I’m sorry, I don’t. I just don’t have the time. Thanks , for the free printable. I have found a cheap way to display subway art. I use a clipboard and laminate the subway art. Then I can rotate it out and reuse it. The link sent to my email does not open/work…please help thanks. I have sent you an email with the files. HI- these are great! Is there anyway we could have them as pictures that we could shrink for a smaller frame? Thanks!!! When you go to print these you should be able to pick the size you want. It says there’s nothing to download…I have no option to even see the art!! You can see the subway art right on the post. If you input your email, the download link will be sent to your email. Thanks so much for these, I love the I can do all things one. I’m trying to cut it out in vinyl but it won’t copy the thin font very well. Could use tell me the name of the font for Things Through & Philippians 4:13. I’m trying to make a graduation gift for our dear friends’ daughter, to hang in her dorm next year. Hi Christine – the font for those are RNS Camelia. Hope that helps. Hi- I received the e-mail with the download link. When I downloaded the file, it is zipped. There is an ad to buy WinZip. I thought these were free. These are free. You should be able to unzip them on your computer.